Hello to all my lovely WOYWW friends, am I glad to seeeeeeeeeee you! Speaking on smart women, I'd like to introduce you to a friend of mine who is going to participate in WOYWW this week, her name is Lori and she does Mixed media canvases and has an Etsy store. We met in a FB group that meets every Monday night and paints and chats together called Mixed Media Mondays with Tracy Weinzapfel, now I told Lori all about you ladies so y'all better behave!! twine, pop dots - misc. I knew immediately that the deer were your pets. Outdoor pets are good. They don't try to sleep in your bed with you and hog your pillow like some PETS I know. OOPS, can't call Bleubeard a pet. He thinks he's the boss and I'm the pet. Loved those cards, though. They are fun, fun, fun. Sounds like you are having fun this week. Love the cards. I have to investigate this game, though I don't really have spare computer time to devote to it...lol!! Words With Friends. LOL. Which one of us are winning currently? Thanks again for introducing me to WOYWW. I will figure out this time difference thingy and get a higher number next week. UGH. This is going to be an addiction. Oh well. It's 5 am here. The kid just left for swim practice, the hubby is on his bike, and I am blog hopping thanks to you. Love it!! A beautiful card and time to play too! wow your projects are just beautiful!! those dear are amazing!! Hi Sandee and Happy New Year (my first visit to your blog this year). Have already been on Lori's blog (I'm trying to visit some new blogs so picking those on the list that end with the same number as mine) and she does some beautiful work. Beautiful projects. DH likes playing FB games too - have fun. Beautiful cards Sandee, I would disagree that you mojo has left you bereft! Hope 2013 is great for you. Hi Sandees, visited your friend earlier. Love your cards, and love their stamps. Your work always amazes me such tallent and diversity. The deers seem to pop, wonderful. Oh I checked out Lori's place, great thanks and the Tracy Mondays amazing. I am not one for playing fb games but it sure looks like you are having fun. Delightful cards, Sandee! Like some of the other commenters, I can't bear to give up any crafting time any longer - pretty much all my other activities (except blog visiting obviously) have given way to the lure of the craft stash!! Happy WOYWW! cute cards and what fabulous pets you have. My Hubby plays that with his Sister and hates when she beats him!!!! I love computer games....they are a great way to relax. Love your deer cards. Have a lovely week and Thank you for your idea about stapling the pad on the holder! 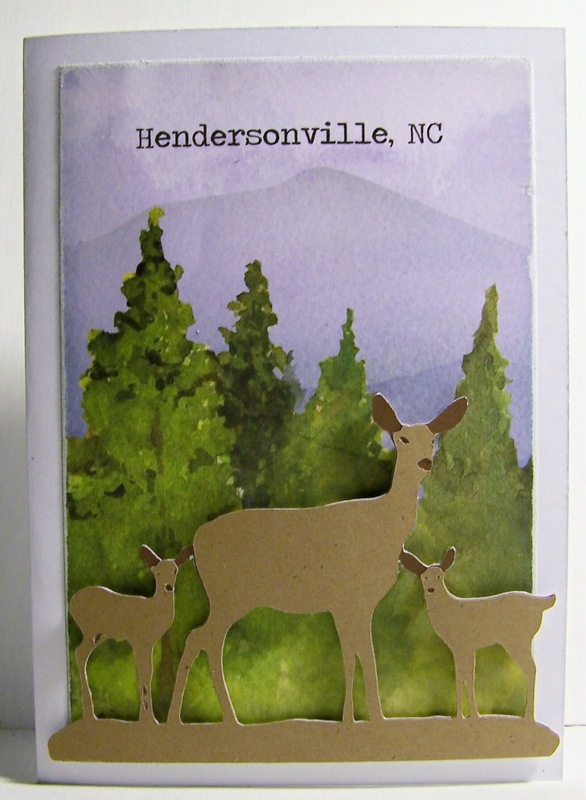 I love your deer cards! I haven't tried words with friends yet. But I am terrible at Scrabble (I've only won once...ever...and we play a lot!) so words with friends doesn't seem like a Katie-game! Hi Sandee thanks for your earlier visit. Will be heading over to visit Lori after this. The deer cards are gorgeous. I used to love Scrabble but don't seem to have the time for games much now unless they're the video kind! Hello Sandee! thanks for popping in today! Love your creations. Off to browse your blog as it is all new to me! Love you creations today as well...and ST Patricks Day cards already...oh my you are on the ball! Delightful post, Sandee, as ever! Your cards are really "deer." Sorry, groan, couldn't help myself. I've been to see your friend Lori and see that she is getting a mahoosive welcome!! She must be thrilled. Any friend of yours is a friend of mine! aha! I need to find you on FB then cos I'm a WWF addict too - but can rarely find someone decent to play against! 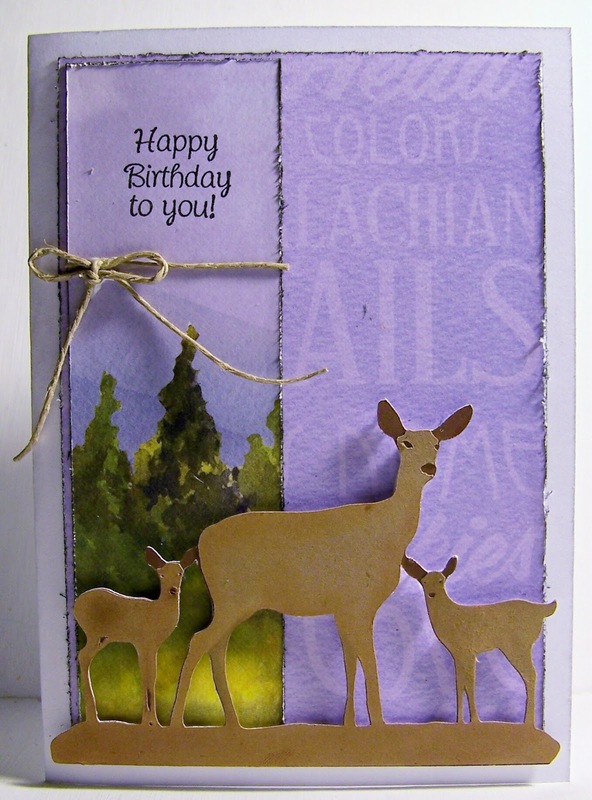 Love the cards you've made - the deer are just darling! I'm late but I am loving your coasters on the current post. Yum Yum. So glad I WAS late this week or I might have missed it LOL! I never got into those games, which is good because I'd never get anything done if I did, lol!!! Love your cards, so pretty! Hahahaha, I get caught up in games on my phone sometimes :) Your cards are beautiful!! I stopped by Lori's yesterday :) Have a great day Sandee! Hi Sandee! Never too late to play WOYWW. Thanks for stopping by my blog, and yes Lori came by too. My goal today is to put the center pieces together for the shower!! (?? )Love your deer card. 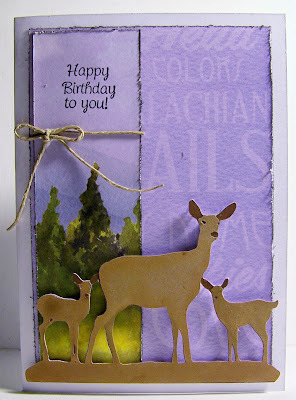 Love the deer card. I think they count as pets. I do fret over the packrat in the yard, both wondering if he is okay and hoping he hasn't decided to move into the house. Cute cards Sandee, sorry late visit but ended up very busy yesterday. Sandee, thank you for introducing Lori to us. I have already paid her a visit. I love what you are doing at the moment! 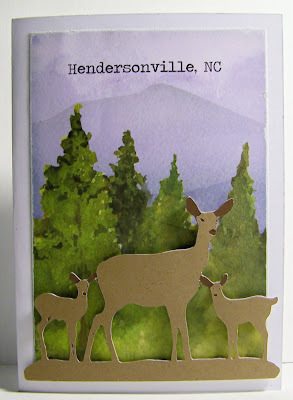 The last card in this post is just gorgeous... Beautiful trees, and I love how you've cut the deer to be the foreground layer. Beautiful work. I've also left you a comment on your latest post as I found this absolutely thrilling! Thank you for your great comment - very complimentary! Rev. Ernest Bear is looking extremely pleased with himself since his makeover, and my hubby is very pleased too. I've now been asked to do radical surgery on Yellow Bear and sew her head back on!!! As for my spoke guards, I'm getting on fine with them and am almost at the decorating stage. I'll certainly be posting some details as I get going - including videos. Hi Sandee, thanks for your visit. Hats off to you trying to visit all the desks! I popped over to see Lori yesterday. I like ODB too! I just get overwhelmed when deciding what to pick. Your cards dimensions and everything is AWESOME!!! U don't play games on FB yet but word and numbers are good for the memory so I hear? Thanks for stopping by and checking out my desk. I haven't been to your spot for a while, but always enjoy your creations and comments. Of course you're a word lover; me too, so I enjoy your word for each post. And thanks for the advice about Blogger. I haven't had a problem before in all the years so I'm bewildered as to why now. I don't really want to take up memory with another browser and I certainly don't want Google to bully me into using Chrome. It might be a Microsoft up-date that's gone ferral. I just LOVE your deer cards... I have that cartridge and have yet to use it! Oh my.. did I admit that?? LOL! Thanks for visiting and happy WOYWW!! Great cards there and I can see some of your hills there! This is beautiful Sandee!! I just love your die cut dies and your scene. Thanks for joining the ODBD Shining the Light challenge this week!! Great desk. I especially like the way your glasses are sitting in your laptop, letting us all know y'all be back at work in just a moment. Thank you so much for visitingl Happy belated WOYWW, Rachel. love your card! wonderful peek at your desk! Thanks for visiting my desk..
beautiful card, and it's nice to see another laptop dominated desk.